Reduced to a tweet, Indian foreign policy could be defined as that of continuity above political differences, and of gradual changes without revolutions. Thus, it came as little surprise that when the Hindu nationalist party, the BJP, took power in India in 2014, and Narendra Modi became the prime minister, the general course of New Delhi’s foreign policy did not change. This also applied to its somewhat less-noted aspect: relations with European countries. The lists of state visits do not entirely reflect India’s foreign policy priorities, but together with an array of other facts they help to paint the picture and list priorities. During the ten years (2004-2014) of previous United Progressive Alliance (UPA) rule, Prime Minister Manmohan Singh visited these European countries: Russia – 9 times (including for a BRICS summit), Germany – 4 times (including one G-8 summit), the United Kingdom – 3 times (including for a G-20 summit), France – 3 times (including for a G-20 summit), and one visit each to the Netherlands, Belgium, Denmark, Finland (for an India-EU summit), and Italy (for a G-8 summit). In comparison, over the course of the last five years Modi paid visits to Russia 4 times, Germany – 4, France – 3, Switzerland – 2, United Kingdom – 2, and once each to the Netherlands, Portugal, Spain, and Turkey. It should be remembered that Modi’s tenure has been half that of Singh’s, however. In 2014, I was one of the naive commentators to believe that, to do things differently, Modi might visit some of the less-important countries of the continent, including those in Central-Eastern Europe. This has not happened and these nations apparently did not rise in the importance rankings of Indian foreign policy. On a general note, it seems that the four European states that top this chart are: France, Germany, the United Kingdom, and Russia. While New Delhi wants to keep its partnerships with all four, with Russia ties have loosened up in a few places. One notable aspect is the strength of the France-India partnership. Paris has put in a lot of effort to keep building this relationship and New Delhi was equally invested to work on it. 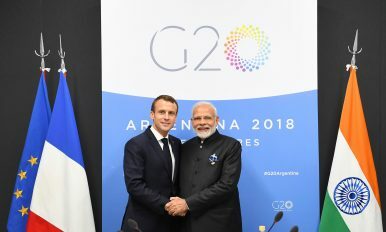 Among various aspects, the defense cooperation between the two countries has hit the headlines most often, mostly due to the controversy around the Rafale deal. In 2012, under UPA-II, the French firm Dassault won the lucrative deal to provide India with 126 Rafale fighter jets. The new Modi government has renegotiated the deal and decided to purchase only 36 aircraft in a government-to-government deal. A scandal over the planes’ reported overpricing has erupted since then and in a way is still ongoing. I do not think that it will hurt France-India cooperation in the long run, however. The decision of Modi’s cabinet did not represent a major plot twist in India’s foreign policy toward France. The doubts about the Rafales’ pricing were emerging already at the end of Manmohan Singh’s tenure. Even when India’s offer was drastically reduced in 2015, Dassault went to great lengths to secure the new deal, and for a certain time the government in Paris was playing the firefighter too, trying to douse the fire of the controversy. With India’s growing appetite for modern military technology, and its inability to produce a large part of it indigenously, countries like the United States, France, and Israel are set to reap the harvest in the Indian market even more. The partnership with Russia has been weakened a bit for the same reasons. When it comes to military technology, Russia has less of what India now needs. New Delhi’s few recent, big-ticket decisions to purchase military hardware from France and the United States echoed with critical remarks in Russia. More importantly, this could have been the reason behind Moscow’s recent and new military cooperation with Pakistan. Modi’s government was very visibly attempting not to alienate Russia, however, but rather retain a partnership with both Moscow and Washington at the same time. Certain recent agreements – especially the S-400 deal – showed that Russian military enterprise is still in the game. Russia is still India’s important partner when it comes to the energy sector and Russian companies have recently invested on the Indian market. Yet, while policymakers and experts in New Delhi want India to be on its own side and not in any international alliance, expectations toward the United States are certainly higher than those toward Russia. A recent survey of over 100 members of the India’s strategic community, conducted by Dhruva Jaishankar of Brookings India, showed that 75 percent of respondents believed the United States to be India’s most important global partner, while only 12 percent opted for Russia. The European Union remains India’s biggest trading partner, considered as a whole. The total EU-India trade has been slowly rising and remained rather well-balanced for the past few years (based on Eurostat data). Three European countries – the United Kingdom, Germany, and Switzerland – are among India’s top 10 trading partners. The negotiations on the India-EU Free Trade Agreement have been stuck for years, however, and the problem was not solved during the current government’s tenure, but given the complexity of the issue Modi’s cabinet is hardly to blame. Across the April 2000-March 2018 period, the United Kingdom remained India’s biggest European source of FDI, as per New Delhi’s data. British companies invested $25.43 billion in India (ranking fourth among all FDI sources and providing 6.75 percent of India’s total FDI). The other important European sources were: the Netherlands: $23.48 billion, 6.23 percent of total FDI; Germany: $10.84 billion, 2.88 percent; Cyprus: $9.57 billion, 2.54 percent; and France: $7.23 billion, 1.65 percent. Despite these aggregate numbers for 18 years, the biggest European investment of 2018 in India can be probably claimed by France-based Schneider Electric. Brexit has caused a lot of anxiety in India as well, with New Delhi asking itself about the shape of its future ties with Great Britain and the coherence of the EU. Yet, while in 2018 it was reported that Indian companies were procrastinating on opening offices in the United Kingdom, Indian investment on the British Isles has also risen dramatically (by 321 percent for 2018). It remains to be seen whether this was because Indian firms wanted to invest before Brexit will make landfall. Talking to Indian foreign policy experts over the last years, I noticed how they have grown interested in Chinese activities in Europe. This is hardly surprising. Many of Beijing’s moves raise apprehensions in New Delhi and European capitals. This is where the scope for dialogue and experience sharing has been widening. The 2017 EU-India summit ended with a joint statement, which, among others, shared doubts about China’s flagship project, the Belt and Road Initiative, pointing out to a lack of transparency and other challenges. The China factor will not become the main driver of EU-India relations, however. India simply lacks the prowess to check the rising Chinese influence in Europe in any meaningful way. What is more, this is simply not New Delhi’s goal and should not be. India will rather use its resources to face China in its own backyard and must first of all work out its own policy toward Beijing, especially after Modi’s failed “Wuhan spirit” experiment. Another international aspect in which the EU and India found themselves on the same page was Iran, with both sides calling for the retention of the 2015 Iran deal. Last but not least, India could feel Europe’s support when struggling to internationally recognize various radical groups as terrorists. India sought to have the leader of Pakistani extremist group Jaish-e-Mohammad deemed a terrorist under the UN Security Council resolution 1267 but this move was halted by China. The sponsors of the resolution, however, included both some of UNSC’s permanent members (such as France) and non-permanent ones (such as Poland).